Update: Samsung Galaxy S9 and S9+ are now receiving the latest June 2018 Android Security Patch with firmware build numbers G965USQS2ARF4 and G965USQS2ARF4 respectively for Verizon variants only. The global variants are still on the May 2018 security updates. It can also be termed as the monthly OTA updates. Regardless, these OTA updates bring the latest vulnerability fixes, security patches, and other general bug fixes. So it is quite important that you install the latest OTA for your S9. In this tutorial we will show you how to update your Samsung Galaxy S9 and all its variants to latest firmware build available via OTA and Odin method. The update comes with a new firmware build number G960FXXU1BRE6 and G965FXXU1BRE6 (or in some cases BRE5). It is rolling out to all the Samsung S9 and S9+ variants including the international or global variants with model number SM-G960F and SM-G965F and the US variants like SM-G960U or SM-G965U. It also includes the unlocked variants SM-G960U1 or SM-G965U1. The Unlocked Galaxy S9 and S9+ have received builds G965USQS2ARD3 and G965USQS2ARD3 respectively featuring the same changelog. The AT&T, T-Mobile, Verizon, and Sprint carrier bound S9 and S9+ are also receiving April updates with builds G960USQS2ARD3 and G965USQS2ARD3. However, carrier bound devices can also flash the unlocked stock firmware using Odin. See below tutorial. You may also like to install LineageOS 15.1 based on Android 8.1 Oreo onto Samsung Galaxy S9 and S9+ using Project Treble. There multiple ways to update your Samsung device. The first method is to update using OTA method. It can be captured by going to Settings > Software update menu and check for OTA by tapping Download updates manually. However, OTA is available by country and region. Alternatively, you can download the full stock firmware for Samsung devices using the SamFirm tool. It will let you download firmware updates directly from Samsung servers. Download the latest stock firmware for Samsung Galaxy S9 or S9+. Now, head over to this tutorial for installation: How to restore Samsung devices? Read: How to root Samsung Galaxy S9 and S9+ and install TWRP? 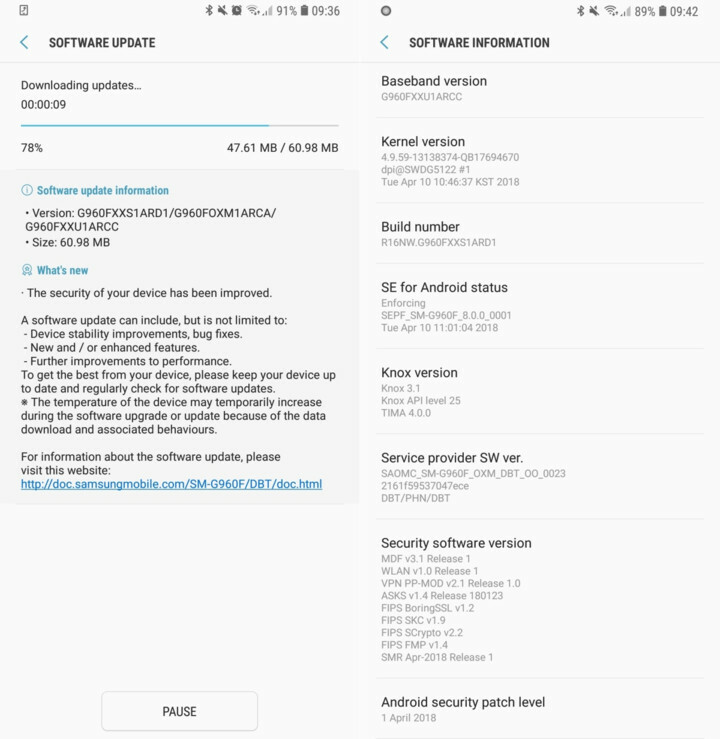 The June 2018 Android Security Patch is now available for the Snapdragon Samsung Galaxy S9 (SM-G960U) and S9+ (SM-G965U) with builds G965USQS2ARF4 and G965USQS2ARF4 or the previous builds G960USQU2ARDA and G960USQU2ARDA respectively. This comes directly from the AT&T servers. The OTA updates have been captured by users of the Galaxy S9 USA variants. 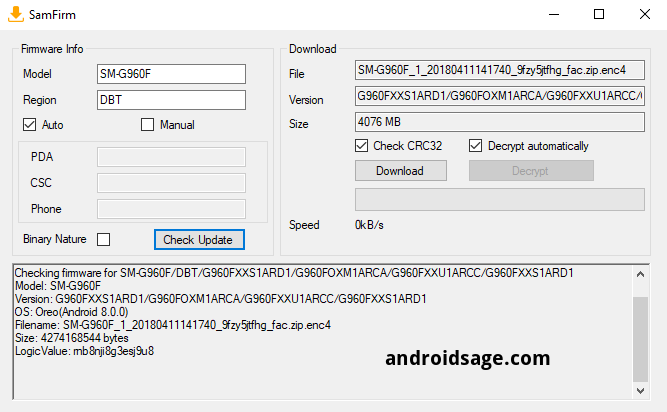 For Exynos S9 variants can download the full Odin firmware and update using Odin method. Unfortunately, the May 2018 security update is not available for the same. This goes for Sprint, Verizon, T-Mobile, AT&T, and unlocked variants of S9. To update you S9 G960U or S9+ G965U to May OTA update, you will need to download the based ARC6 Odin for S9 firmware and the manually install OTA update for S9. Same goes for the ARC6 Odin for S9+ and OTA update for S9+. See how to install OTA updates on Samsung devices from here. How to update Galaxy S9/S9+ using Odin? In this tutorial, we will show you how to update your Samsung device manually by flashing the stock firmware via Odin tool. Note 1: Following this needs a factory reset. So backup is important. Note 2: If your device is a Snapdragon S9 variants from USA, then you will need to see the download section. Download the stock firmware using above method. Visit this tutorial for detailed instructions. Step 2: Connect your Samsung device to PC via USB cable. Step 3: Download and extract Odin tool on PC. Step 4: Also, extract the full stock firmware from S9 you downloaded earlier. Step 5: Enter the stock firmware folder. If there is only one file, then add it to the [AP] section of Odin. Or if there are 4 files, then add each file to their specific slot in Odin such as BL, AP, CSC, etc. Step 6: Once the Odin shows a connected device, start the firmware installation. Step 7: Once done, your device will automatically reboot into system.